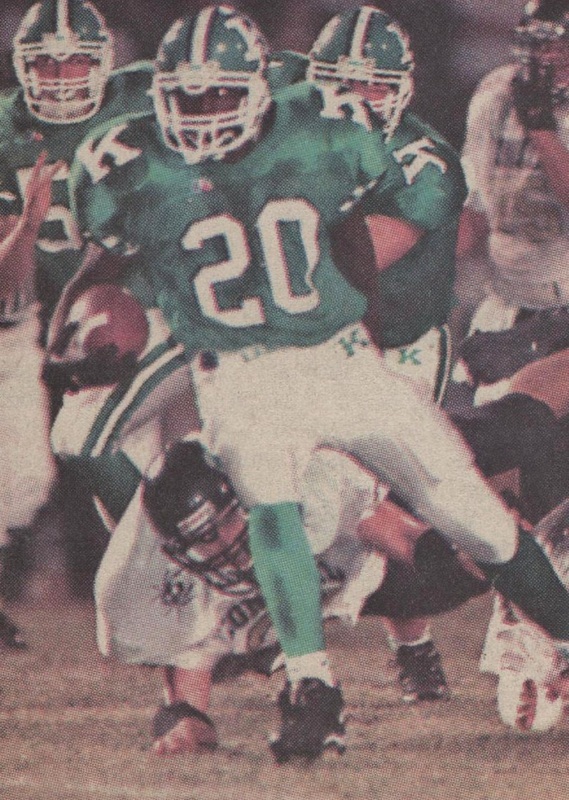 As the Battle for the Bell entered into the Y2K generation a decade of bell game dominance by the Green and White looked to continue, however there would be some major changes in the landscape to come beginning in the first year. Gone was Bruce Hardin the Wonders long time mentor who departed from the Wonder nation in early 2000 to join his two sons Justin and Blair at The Citadel. A massive void was left on the coaching staff with some big time shoes to fill. This would be no simple task, and expectations would be no different for the next guy. Hardin's replacement would come in the form of Kings Mountain head coach Ron Massey. Massey picked up shop from a very successful Kings Mountain program in 2000, and headed North for K-Town, an opportunity he couldn't pass up. 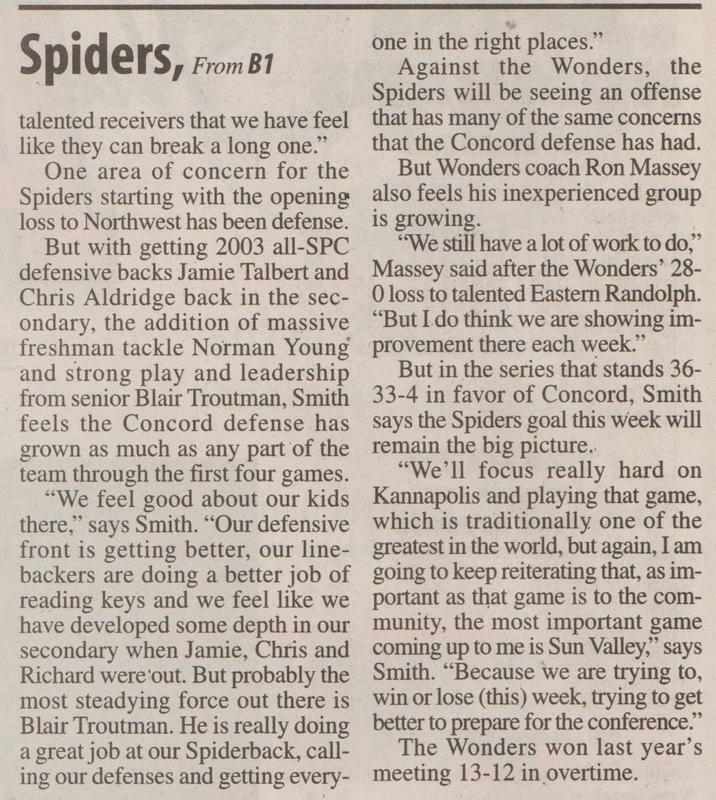 In Massey's ten years as head coach he defeated the Spiders seven out of ten times not including the 2001 forfeit by Concord. Since 2000 the series has seen many firsts for the record books worthy of noting. 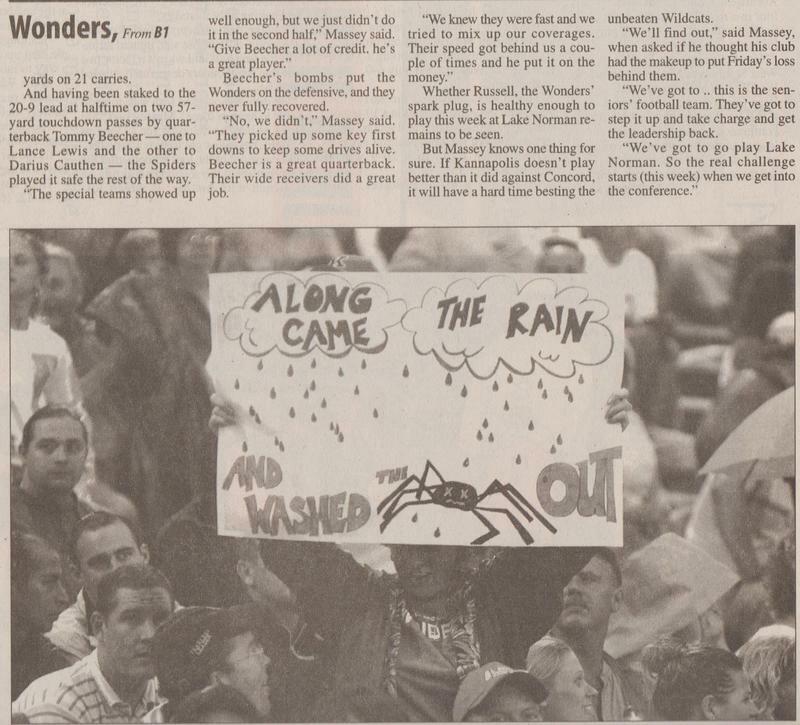 In 2001 the Spiders were forced to forfeit their 21-0 victory over Kannapolis due to an ineligible player that coach E.Z. Smith reported when this information was brought to his attention. This spoke volumes for the integrity of coach Smith and his program. The Spiders kept the Bell, but had to forfeit the win for statistical purposes. 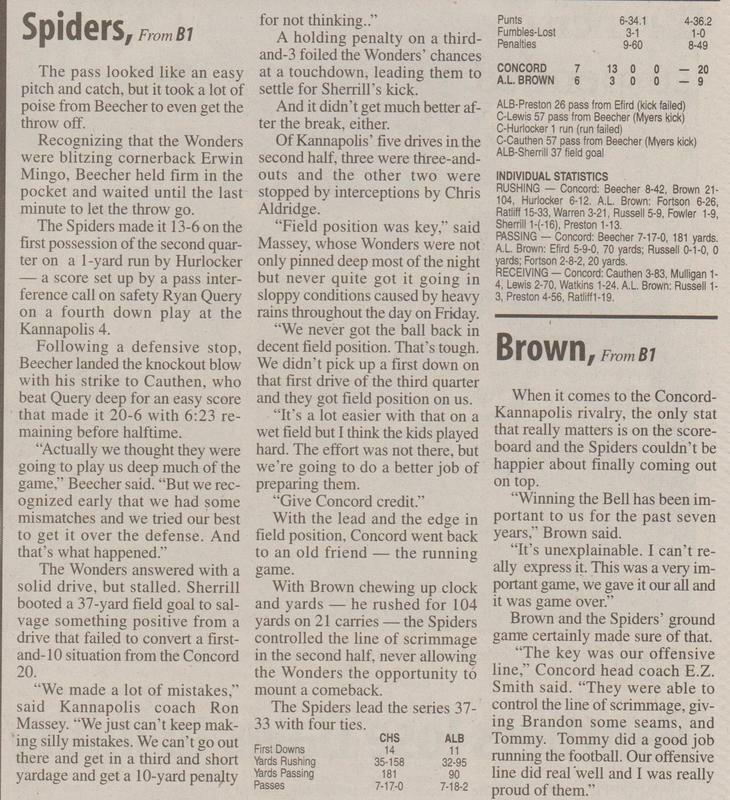 In 2003 the Bell game would see its first overtime session as the Wonders defeated the Spiders 13-12 making that game the only bell game in rivalry history not to be decided in regulation. In 2008 long time head coach and Concord Spider icon E.Z. Smith would call it a day as the head coach of the Spiders following a dismal 2008 season that saw the Spiders miss the playoffs for the first time since 1995. Smith's 2008 Spiders would also have the dubious distinction of giving up the biggest margin of victory to the Wonders in the Battle for the Bell 56-6 in Smith's last game at Bailey Stadium. Smith had come full circle, and there was nothing left to prove. 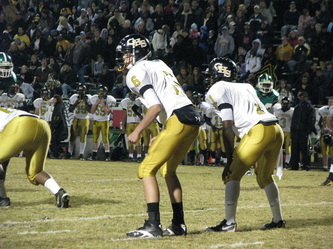 In 2009 former assitant to coach E.Z. Smith, Glen Padgett would be named as Smith's successor to the Spider football program. 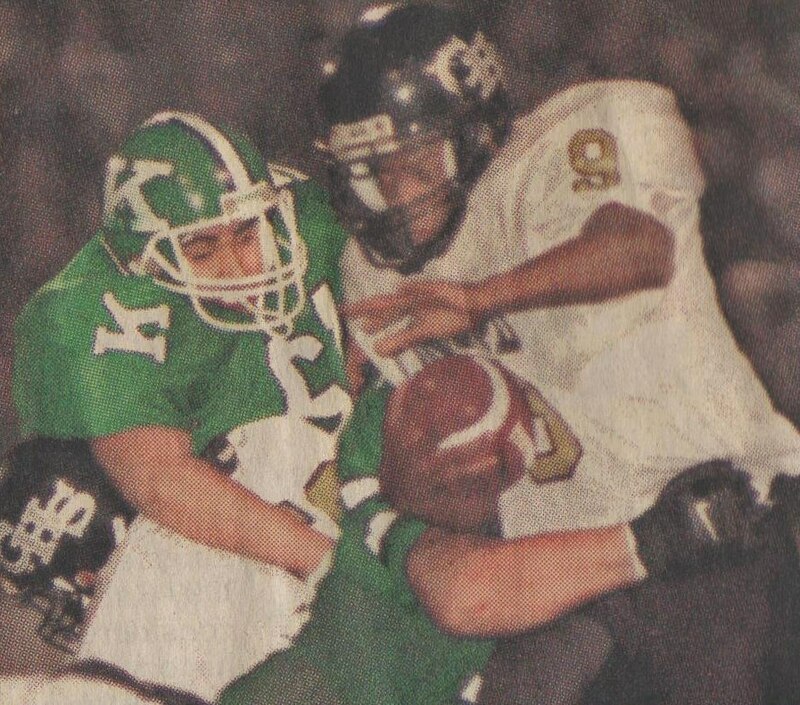 That same year in a scene reminiscent of the 1974 battle for the bell, the heavily favored Wonders would lose to the Spiders in coach Padgett's inaugural year 13-10 at Memorial Stadium making it one of the greatest upsets in rivalry history. The Wonders would still take the SPC championship, but it was little consolation for the unthinkable loss. 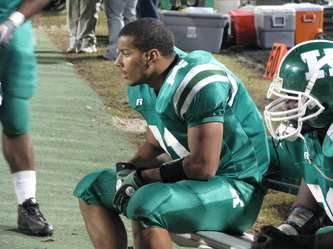 In 2011 Wonder head coach Ron Massey shocked the town when he announced his intention not to return for the 2011 season. Once again the Wonders found themselves in the same spot they were to begin the new millenium. On May 9, 2011 the Kannapolis City Schools named Matthews Butler head coach Mike Newsome as the Wonders new head football coach. The same year as with both Bruce Hardin, and Ron Massey coach Newsome would defeat the Concord Spiders 31-26 at Memorial Stadium giving coach Newsome his first ever Bell game win in his first year. So there you have a brief look into this ongoing rivalry that has captivated two communities for over eighty years, and one thing is for certain. The bell game, like a fine wine only gets better with age, and as the rivalry reaches it's eighty second year one thing you can count on is there will be no lack of excitement, and plenty of memorable moments yet to come. 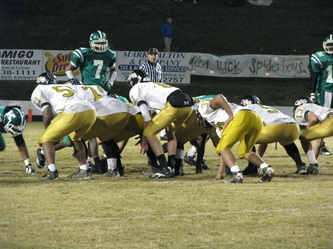 "The 2000 Battle for the Bell"
Four year starting defensive linemen for the Concord Spiders E.Z. Smith the IV makes his final appearance in the Battle for the Bell game and stands opposite Wonder captain Josh Lee and Lee Basinger. The first points of the game would come with 3:20 left in the first period. Durand Lipscomb would carry the ball off tackle five yards for the touchdown. Wonders would take the lead 7-0. With six seconds left before the half, and the Spiders making their deepest drive of the first half into Wonder territory. Concord QB Jared John on third and goal would roll right, and connect with a wide open Charlie Fox in the endzone. Fox would almost take the INT the distance getting tripped up by a Spider defender at the Spider forty. On third and three with 3:35 left in the third quarter Wonder runningback Chris Carter would find a seam up the middle and take it five yards into the endzone for the third Wonder score of the evening. PAT would be true, and the Wonders would begin to pull away from the Spiders 21-0. With thirty five seconds left in the third quarter Wonder QB Josh Lee would pump fake, and find Chris Carter behind the secondary in full stride taking the ball to the Spider one. Josh Lee would then take the ball the remaining distance for the last Wonder score of the evening. PAT would be good and the final score would be 28-0 Wonders over the Spiders. An unidentified Wonder gives four year Spider defensive standout E.Z. Smith IV a hug in a display of sportsmanship after a humiliating 28-0 defeat at the hands of the Wonders. 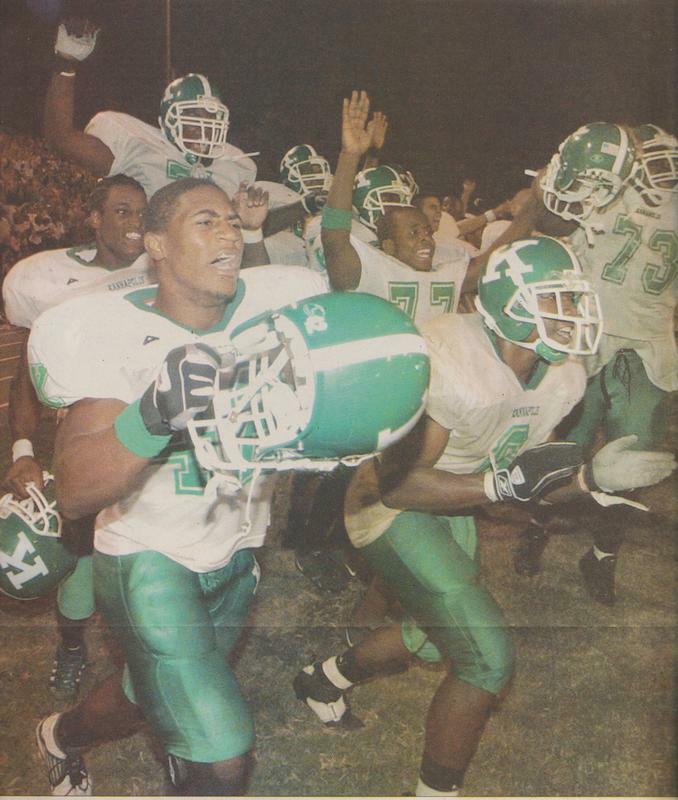 The Wonders would exact revenge this night after being knocked out of the state AAA playoffs in the second round the year prior in 1999. Smith's father head coach E.Z. 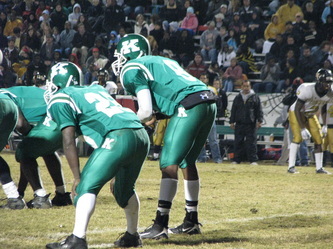 Smith III would retire eight years later at the conclusion of the 2008 season. 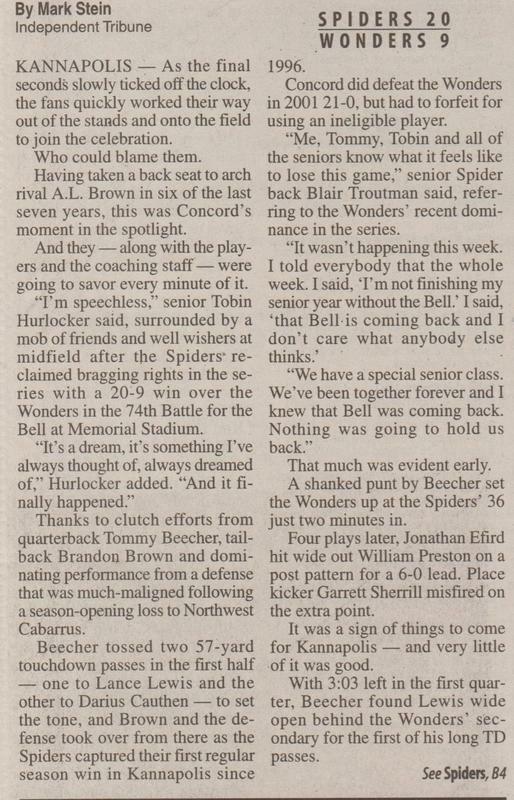 "The 2001 Battle for the Bell"
The following year the Wonders and Spiders would hook back up at Robert C Bailey Stadium with the Wonders already having two losses for the season. 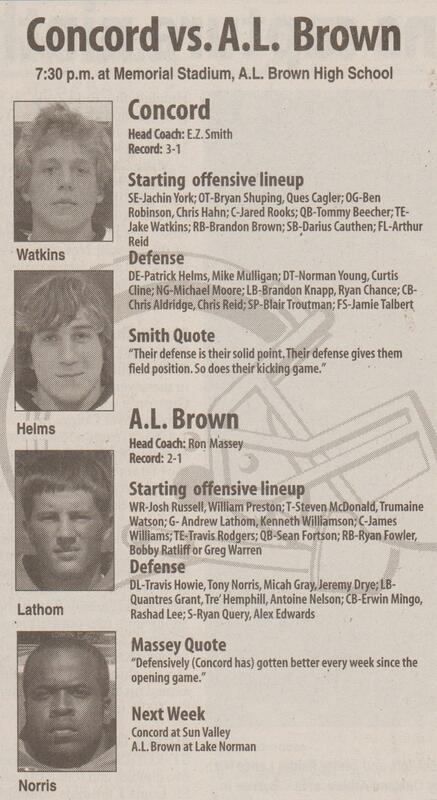 The Spiders would be hellbent on getting even for the 28-0 shellacking at the hands of the Wonders in 2000. The Spiders had gone four years straight without seeing the bell, and this game would be one that the Spiders wanted badly. The first score of the night would come courtesy of Spider back Franswa Sumlin from eighteen yards out. The PAT would be wide left and the Spiders would lead with 5:32 to go in the first quarter. Both defenses would stand tight throughout the rest of the first half, and the Spiders would take a precarious 6-0 lead into halftime. Turnovers were the Wonders albatross this night. On this play Wonder QB Drew Mahr would be stripped of the ball while Spider defender Reggie Lee would scoop the ball up and carry it into the promised land. Coach Smith would go for the two point conversion and get it with 8:49 left in the third period. The Spiders would lead 14-0. When it rains it pours. After another Drew Mahr fumble the Spiders would get the ball on the Wonders one yard line. The Spiders would take advantage on a dive up the middle by Franswa Sumlin. This would prove enough to put the Wonders away. The PAT would be good and the Spiders would take the game 21-0 putting an exclamation point on the victory with a shutout of the Wonders. 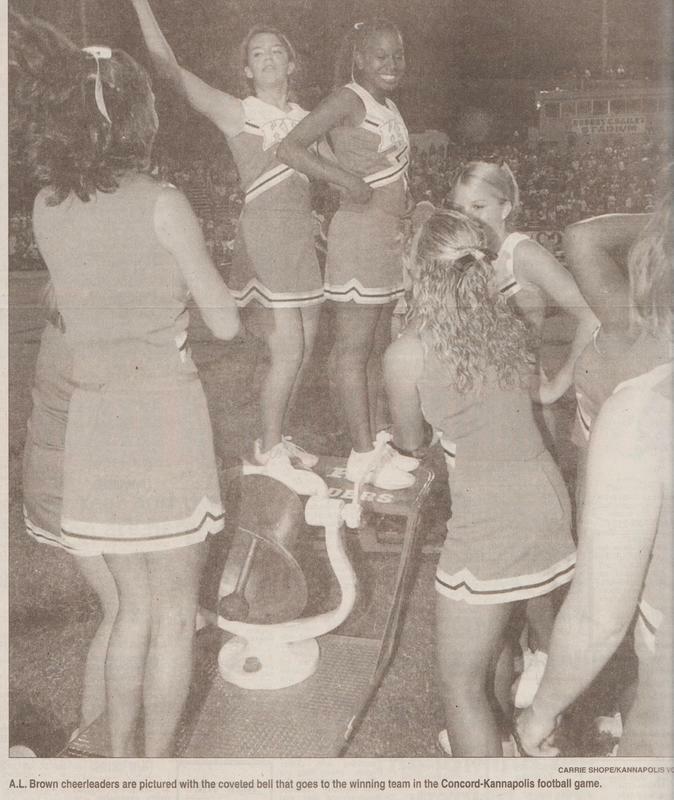 (Picture Left) Jubilant Concord cheerleaders take a victory ride on the bell as it is exchanged during the 2001 defeat at the hands of the Spiders 21-0. 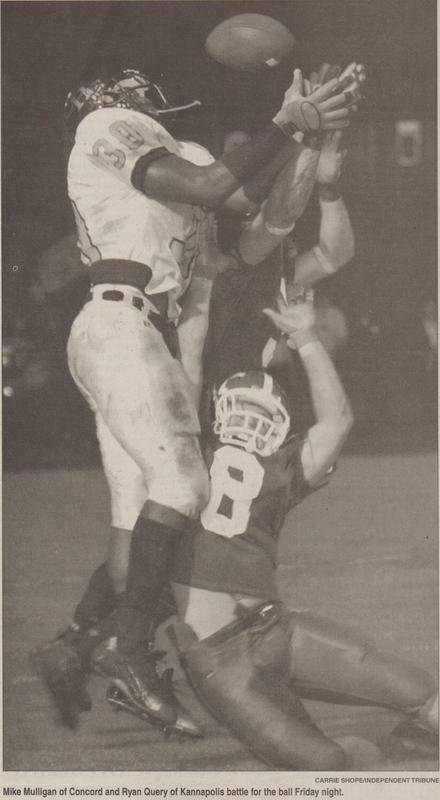 Later that season coach Smith would discover he had inadvertantly played an ineligible player during this game subsequently reporting it to the NCHSAA. 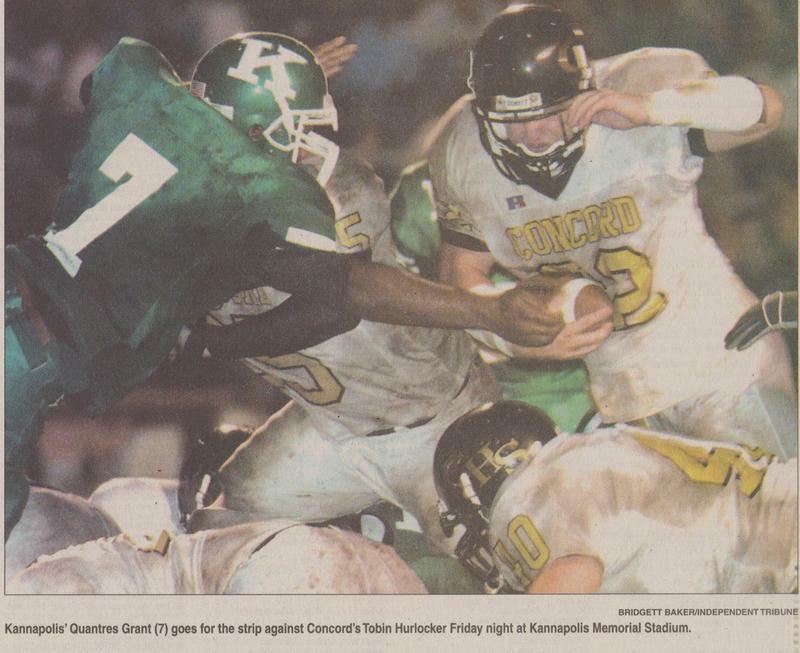 The Spiders would be forced to forfeit this game to the Wonders, however the victory bell would remain in Concord until the following year. The game would oficially go on record as a 1-0 win by the Wonders. A Jubilant group of Spiders fans storm the field to claim the bell after a four year draught at the hands of the Wonders. Still the show of sportsmanship showed above all else as the Wonders would look forward to next year to exact their revenge. The 2001 Battle for the Bell would be a very well played game by the Spiders, and a very lackluster performance by the Wonders. Turnovers wre the Wonders biggest problem this night which led to two of the Spiders three touchdowns. Wonder Reciever Aundrae Allison would take a massive hit in the second quarter knocking one of his teeth out. Allison would not return to the game. Nearing the end of the 2001 season head coach E.Z. Smith of Concord would discover he had inadvertantly played an acedemically ineligible player in the game,and reported th discovery to the NCHSAA. The Spiders were forced to forfiet the game to the Wonders this year. The game would oficially go down in the record books as a 1-0 victory for the Wonders. (Picture Left) Spider linebacker Andy Boyd shakes hands with Wonder Kendall Turner after their 21-0 win over the Wonders at Bailey Stadium. Head coach E.Z. Smith talks to Woody Caine after the game to give his thoughts on his teams performance. "The 2002 Battle for the Bell"
The first points of the game would come 1:42 left in the first quarter on this nine yard TD pass from QB Brandon Franklin to Josh Russell for six. The PAT would be good Wonders would take the early lead 7-0. On second and five from the Spider forty QB Brandon Franklin would hook up with Josh Russell agaiin on a forty yard touchdown strike. Chase Lowder's PAT would be good, and the Wonders would go up 14-0 with 10:51 left in the first half. The Brandon Franklin show would strike yet again just before halftime on this forty two yard touchdown pass to Derrick Williams. Lowder's PAT would be true and the Wonders would pull away 28-0 with 2:50 left in the first half. With 1:56 left in the third quarter the Wonders would extend their lead on this five yard plunge up the middle by RB Justin Galarza. Chase Lowder's PAT would be good and the Wonders would lead 35-0. In yet another first in the Battle for the Bell series the Wonders take the bell from "No Mans Land" at the east endzone. After the Spiders were forced to forfiet their 2001 victory the Bell would remain in limbo until the 2002 game could be decided. 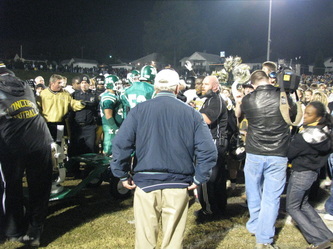 Coach Massey gives his post game thoughts to Woody Caine after the 2002 Battle. 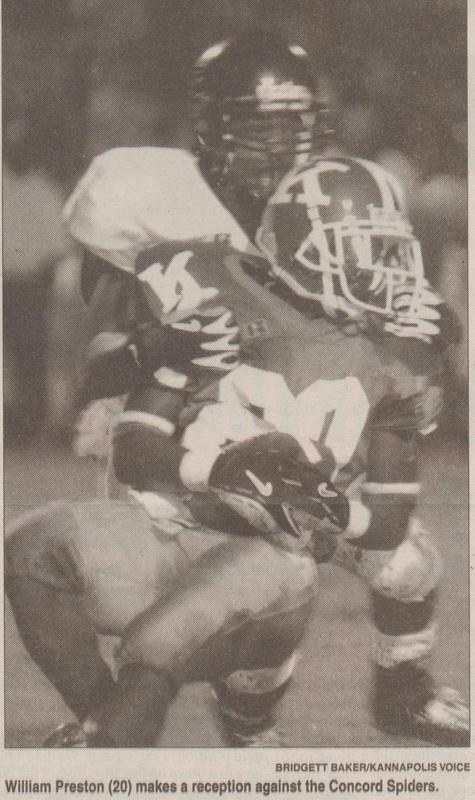 "The 2003 Battle for the Bell"
In Ron Massey's third Battle for the Bell game in 2003 history would be made as the Spiders and Wonders would end up having to settle this game in overtime. This would be a first in the history of the rivalry. For three and a half quarters the Wonders and Spiders would battle eachother to a 0-0 deadlock. Probably considered one of the most spine tingling games ever played between the two schools this game would not be for the faint of heart. Randy and Woody break the news to the viewing audience that this bell game would be the last game for the boys of TV-13 Twenty six years of coverage would be ending on this night. Very sad news for all who supported Wonder football as well as high school football in Cabarrus County. With 3:55 left in the game the Wonders draw first blood on this thirty one yard field goal by Garrett Sherrill. This would put the Wonders up 3-0, but things were about to get exciting at Bailey. After getting into field goal range on a long pass play the Wonders would tie the game on this twenty five yard Garrett Sherrill field goal with one minute left in regulation. The Spiders would win the coin toss and choose to go on defense. The Wonders would go ten yards on two plays scoring on this one yard sweep by Artiss Butler. PAT would be good. Wonders-13 Spiders-6. The Spiders would would score on this eighteen yard touchdown pass from Tommy Beecher to a wide open Spider reciever in the corner of the endzone. This would bring the Spiders within one point of sending the game into a second overtime. The Wonders would ice the Spider kicker which ended up working for the Wonders. The Wonders would retain the bell another year. Coach Massey gives his final thoughts on the overtime win at Bailey Stadium over the Spiders. What a great game to be the possible last game. 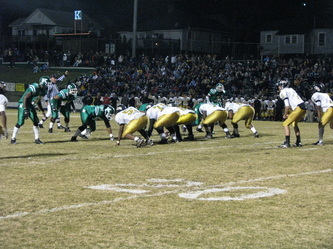 The TV-13 crew would go on to cover the Bell game until 2006 after which time the game would be covered by Time Warner Cable as part of the "Great American Rivalry" series sponsored by the United States Marine Corps. "The 2004 Battle for the Bell"
"The 2005 Battle for the Bell"
After a Wonder turnover put the Spiders deep in Wonder territory Spider QB Jimmy Drye connects with reciever Lance Lewis for the first points of the game with 6:44 left in the first quarter. Concord-7 Wonders-0. Matching good with good Wonder QB Sean Fortson scores on a fourteen yard touchdown after rolling out right. PAT would be true and the game would be deadlocked at seven a piece. Wonder QB Sean Fortson executes a perfect read option and outruns the Spider secondary forty five yards for the touchdown. PAT would be wide left leaving the Wonders with a 13-7 lead with 6;50 left in the third quarter. Just like dejavu with 7:26 left in the game Sean Fortson scores again on a roll out to the right corner of the endzone putting the Wonders up 19-7 after a failed two point conversion. Wonders content to run the clock out and as time expires the team storms to the other side of the field to take the bell from Concord. Probably one of the more dangerous things to do not letting the Spiders drag it accross. This would raise some eyebrows as to bell exchange etiquet. Coach Massey gives post game comments to Woody Caine after the game. "The 2006 Battle for the Bell"
On second and goal from the Wonder four yardline Spider runningback Mike Moore would score on this four yard plunge up the middle to put the Spiders up 7-6 with left in the first quarter. Wonder QB Jonathan Efird connects with Artrelle Louis on this twenty five yard touchdown strike with 9:04 left in the first half. The Wonders would go for the two point conversion. Efird would connect with tightend Zack massey putting the Wonders up 14-7. The Spiders would tie the game with 7:12 left in the second quarter on this tip drill score by Lance Lewis. Chad Myers PAT would be good and all would be deadlocked at fourteen. On second and three with twenty seconds left in the first half Roger Smith scores on this eleven yard touchdown run to put the Spiders up 21-14 just before halftime. Spider runningback Mike Moore scores six on this four yard touchdown run up the middle with 2:44 left in the third quarter. This would put the Spiders up 28-14 over the Wonders. Jonathan Efird connects with Josh Gray on this forty five yard touchdown pass on fourth and three with 7:31 left in the game. Two point conversion would be no good. Spiders-28 Wonders-20. With 1:15 left in the game Spider runningback Mike Moore seals the deal for the Spiders on this three year run off tackle to put the Spiders up 35-20. Adding insult to injury. Wonder QB Jonathan Efird is picked off by Spider DB Lance Lewis for this pick six. Spiders putting the most points on the Wonders they ever have in the series. 42-20. Dejected Wonders drag the bell back over to the Concord side while jubilant Spider fans celebrate with their team. It always hurts to lose this one. 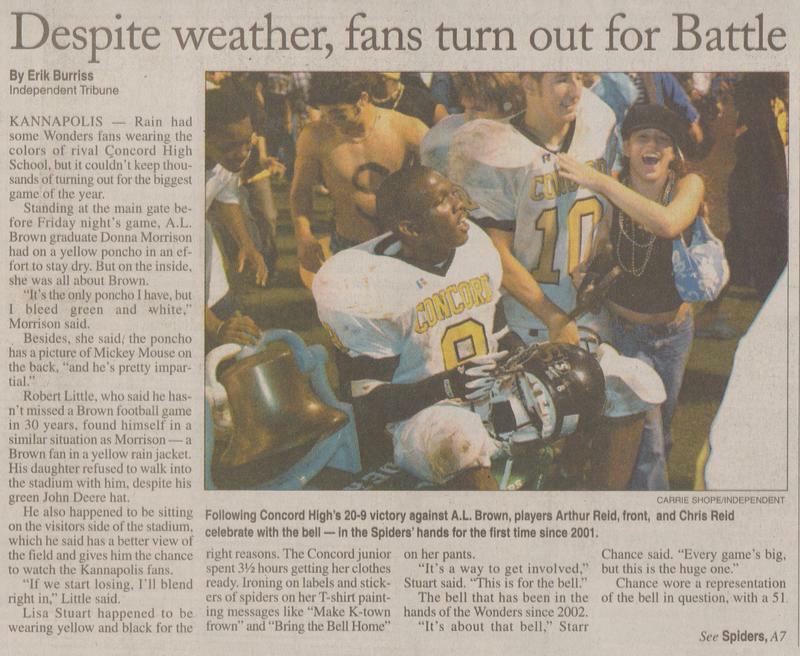 "The 2007 Battle for the Bell"
"This was one of my career goals — beating Concord," said Efird, who saw action in both of the Wonders' previous Belllosses to the Spiders (in 2004 and 2006). everybody doubted what we could do against a good team. We responded with what we can do against a good team. Hopefully, this will make some people worried going into the playoffs." T.J. Johnson — and added 59 yards rushing as Brown went up 28-7 at the break. Wonders' backfield reserves, stepped up as well. Kennedy ran for 41 yards in the second half, while Williams put up a game-high 62 yards and one score (a 3-yard run early in the fourth quarter). played his best overall game. Then Johnathan and Quincy came in and picked up the slack. "(Concord) is tough to run against. We were able to break a couple seams and keep them honest, then hit the passes when we needed to." 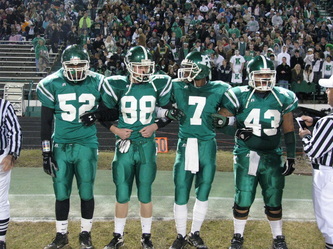 "The 2008 Battle for the Bell"
Historically considered to be one of the most lopsided Wonder victories in rivalry history, the Wonders and Spiders played in some tight games in the past, but this game would not be one of them. In Coach E.Z. Smith's last Battle for the Bell Game the outcome was not exactly the way the charismatic head coach of the Spiders wanted to go out. 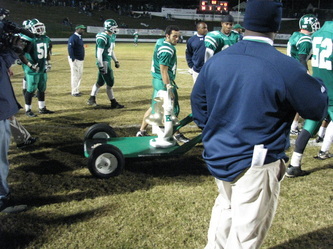 At the conclusion of the 2008 season long time head coach E.Z. Smith would say good bye to his alma mater after being named head coach at Concord in 1980. Along with coach Smith's exit a good portion of the spice that has made this rivalry so much more entertaining went with him as well. No matter what you may have thought of coach Smith personally, you couldn't deny him. Coach Smith "the man you love to hate" was, and is the embodiment of Concord High School. 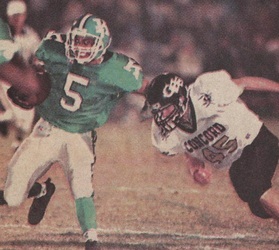 His accomplishments at Concord Senior High School were of epic proportions, and his contributions to the sport of high school football in Cabarrus County, and the state will long be remembered in North Carolina High School Football History. "We We "We Appreciate You Covering Concord Football"
a share of another South Piedmont Conference championship. 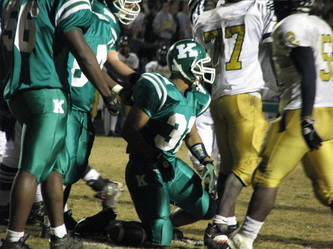 "It was a great team effort and a great win for us," Kannapolis head coach Ron Massey said. "It gets us at least a tie for the conference championship and hopefully a good seed for the playoffs. "I'm just glad we were able to come out and play real well tonight." of the Wonders' first three scoring drives was 41 yards. 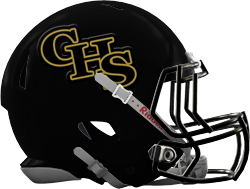 Concord got its only score of the came on a 9-yard pass from Ben Brill to William Propst which capped a long drive and made it 21-6. But the Wonders answered right away. Johnathan Williams ran for 24 yards and Lott ran for 29 to set up a 1-yard scoring run by Travis Riley. After an interception by Chris Moore on Concord's next possession, Williams ran off tackle for an 8-yard touchdown to make it 35-6.The Wonders scored 28 points off Spiders' turnovers in the game. In the second half, Lott added a 41-yard touchdown run and threw to Zach Massey for a 14-yard score – his third passing touchdown of the game. An 11-yard scoring run by Riley early in the fourth quarter finally capped the scoring. 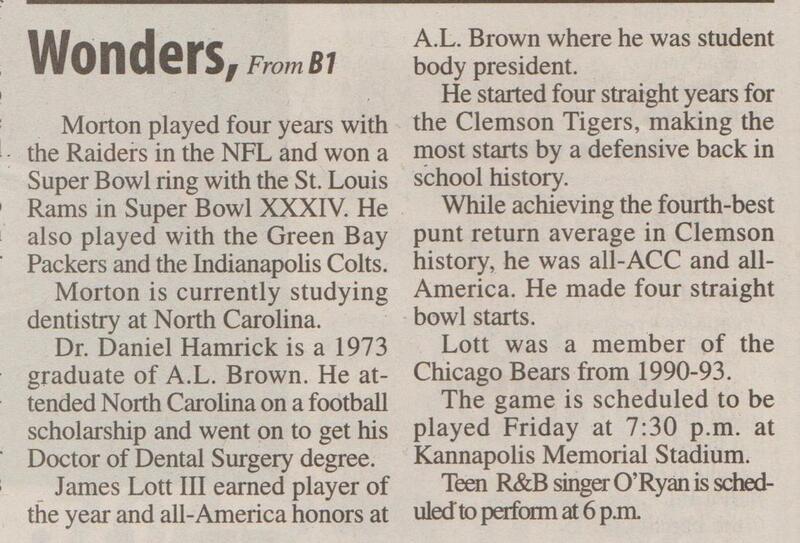 Lott ran for 128 yards on just six carries, while completing 5 of 10 passes for 93 yards. 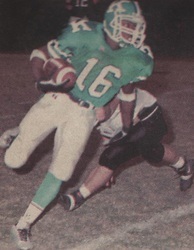 Antwoine Jordan added 68 yards on eight carries as the Wonders totaled 245 rushing yards. "I thought all our backs ran hard, the offensive line did a great job protecting," Massey said. "The defense got takeaways and held Roger in check a little bit. "Our kids were really focused all week. Our seniors did a great job." Smith rushed for 164 yards on 39 carries, with 106 in the second half. Concord still leads the series 38-36, with four ties. 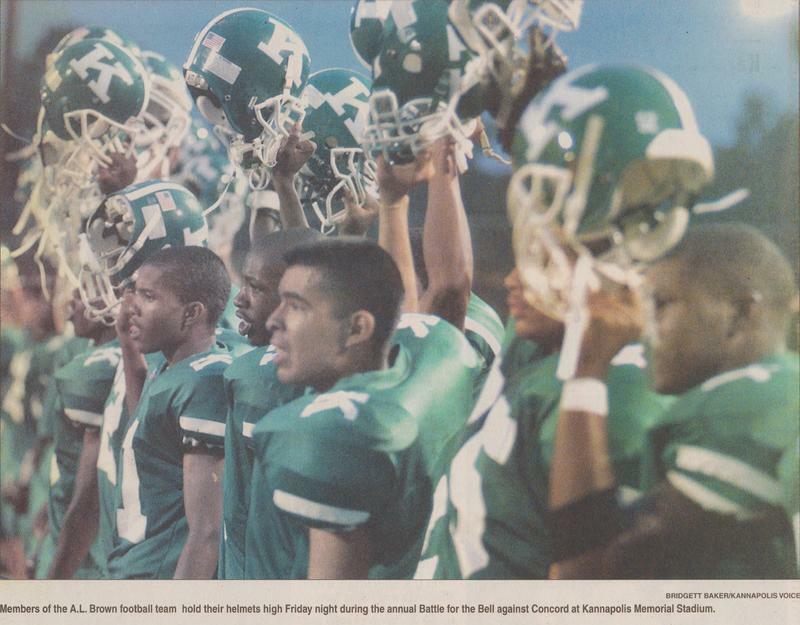 "The 2009 Battle for the Bell"
"We couldn't get any rhythm going," coach Ron Massey said after Kannapolis (9-2, 6-1 SPC) offered a well-meaning but clunky performance. "We'd make a play and they'd come back and undo it. Everybody's tried to stop our running game all year and we've been able to adapt. We just didn't do it tonight." A standing-room-only crowd watched Concord (5-6, 5-2) blank the Wonders in the second half and close the regular season with its fifth straight win. Kannapolis rushed for 190 yards —including 116 by juniorback Travis Riley — but that was more than 100 below its weekly average. And despite averaging 38.5 points per game, the Wonders were limited to a first-quarter touchdown and a second-period field goal. All the scoring came in the opening half. Concord struck first when wideout Jacquise Moore caught a 43-yard TD pass from freshman quarterback B.J. Beecher, spinning away from Kannapolis defensive back Quin Gill and down the left sideline. It was the longest play of the game and put the Spiders ahead 7-0 late in the first quarter. "We made too many mistakes," linebacker Terrance Johnson said. "They might have been lucky on the first touchdown, but everybody on offense and defense could have done a better job." "Our defense gave us a chance and we didn't get in the end zone," Massey said. "Those guys kept us in the ballgame. The defense really played well and gave us decent field position throughout the second half. We just didn't get it done offensively."